There is an old saying that love is even sweeter the second time around. 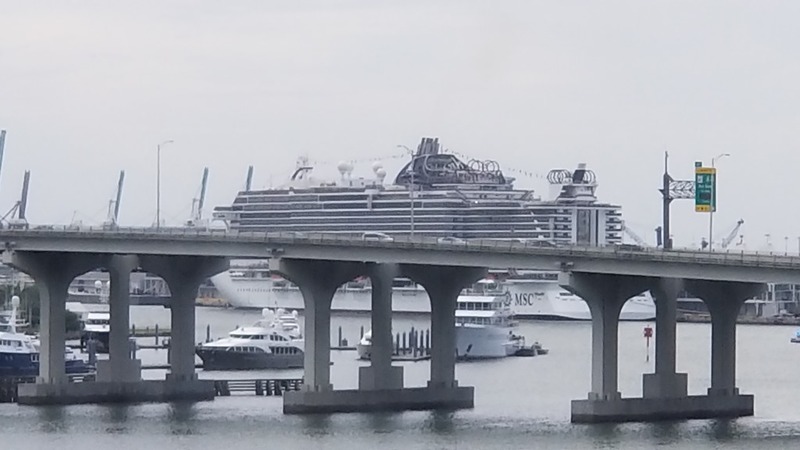 Whether or not that’s true of human interactions is up for debate, but after my recent second cruise in the Yacht Club on the MSC Seaside, I can attest that for me at least, it’s accurate in regard to cruising on this beautiful ship. 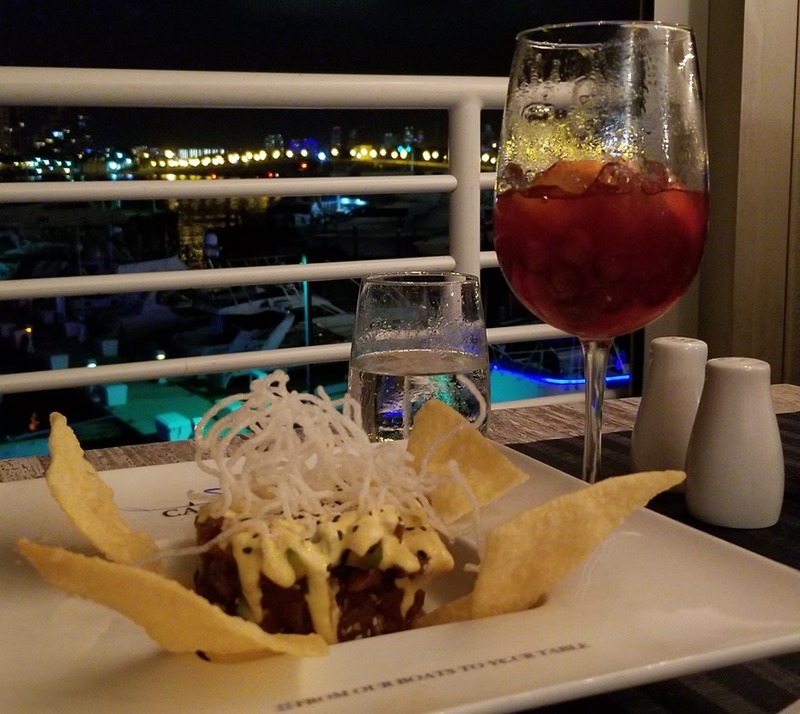 I was so impressed with the Seaside after my February 2018 cruise that I wrote an 8-part glowing review and then followed up with several blog articles about different aspects of my new favorite ship and my new favorite cruise line. Don’t worry – I’m not going to be quite that prolific this time. 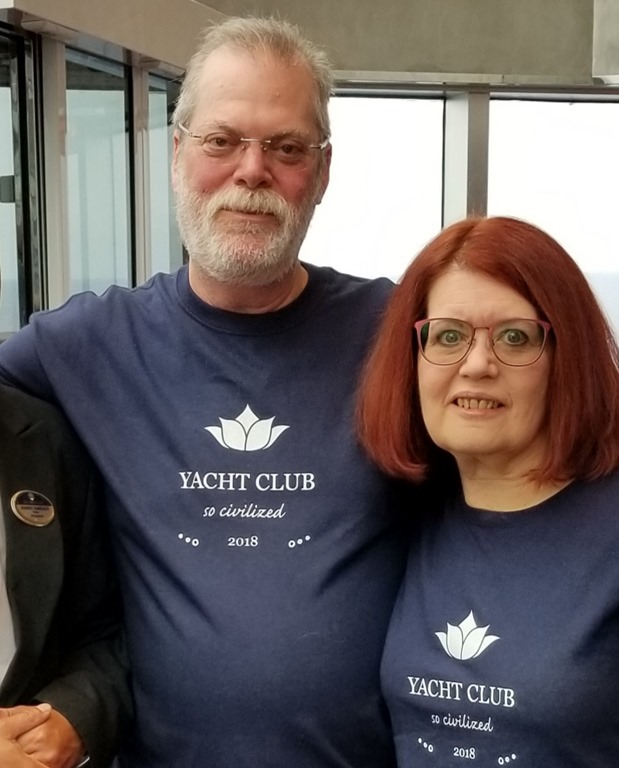 Executive Summary: The short and sweet of it is that I am still in love with this beautiful ship and with the MSC Yacht Club experience in particular, and if anything, it was even better this time than in February (which I wouldn’t have thought possible). 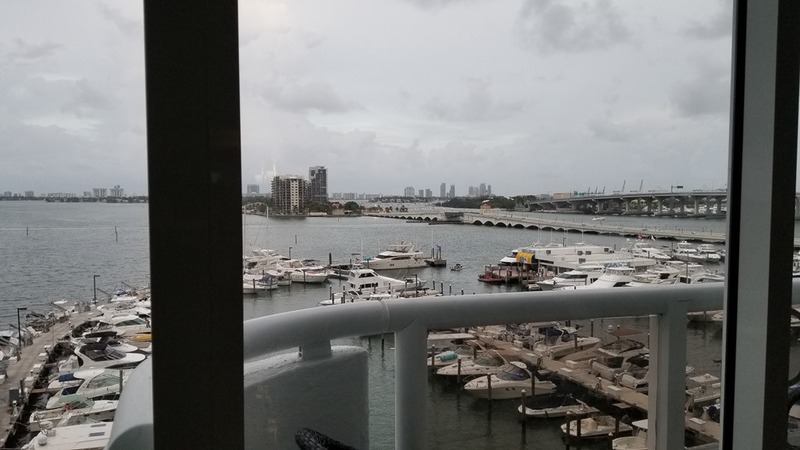 There’s no need to do a blow-by-blow description of every single day since much of the cruise was the same as the previous one (and that is a very good thing). So if you haven’t read that 8 part review, please do for details that I don’t address in this one. In this review, I’ll just give my overall impressions and address those things that have change d or that I did this time that I didn’t get around to in February, as well as what we did in the ports. I knew that this one was already going to be different in some ways from the get-go, because instead of traveling solo, I had my husband along with me this time. He had read and listened to my raves about how great the Yacht Club was and wanted to experience it for himself. I was thrilled to have him accompany me but also a bit anxious. Would the things that so impressed me leave him cold? Had things changed for the worse in the six months since I first sailed? Would we have the same good luck with getting a great cabin and excellent service as I’d had before? Despite not being a big fan of cruising in the past, Tom seemed to be genuinely looking forward to this one. He even got into helping me plan for dressing up on the theme nights – which I didn’t expect – and acted excited about the Yacht Club amenities. As the sail date approached, I was cautiously optimistic. Tom falling down the stairs and spraining his ankle badly the evening before my 12 day repo cruise, almost causing me to fly back home without boarding. 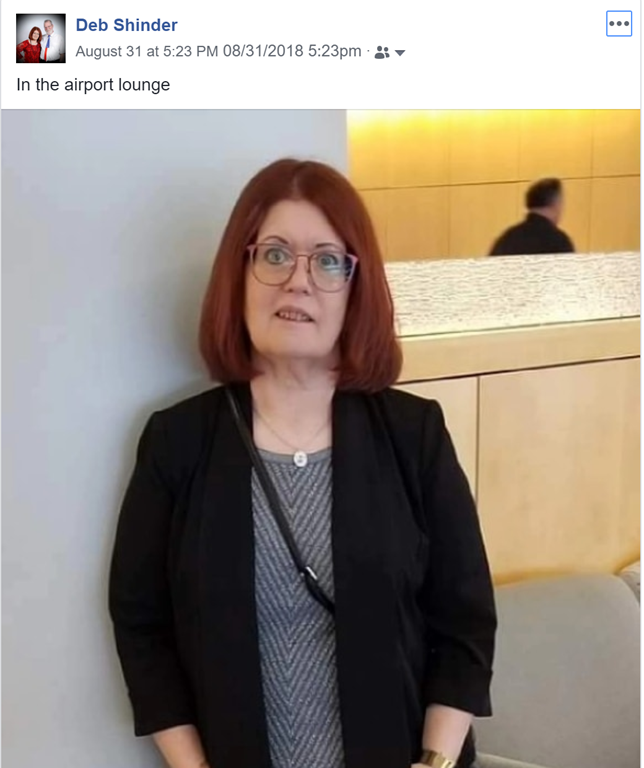 Discovery of credit card fraud and the loss of my bag the day before embarkation on our 20th anniversary cruise. A Greek air traffic controllers strike that shut down the Athens airport the day I was scheduled to fly in for my Mediterranean cruise. A flood in Galveston that almost prevented us from getting to the cruise terminal for a pre-Christmas cruise. Tom coming down with a horrible throat infection the day I left for a 10 day Journeys cruise – and giving it to me when he kissed me goodbye so that I had to spend half the cruise quarantined in my cabin. A hurricane that wiped out the St. Thomas resort where we were booked to spend a week. Tom forgetting to renew his passport, which I found out the day we were supposed to fly to Grand Cayman, resulting in the cancellation of that trip and loss of the condo rental. You can see why we were both a little anxious and worried that something bad might happen to mess up this vacation. Amazingly, though, on fly-away day, everything went off without a hitch. Kris came over the night before and was there to take over house and pet duties; we got all the bags loaded without forgetting any; we made it to the airport and found a parking space without incident; checked our bags at the curb and got priority tags; we were there early and got through security easily, then settled down for a nice snack in the Admiral’s lounge until boarding time. Boarding went quickly and easily. We don’t like spending the money or miles for first class on a short flight, but I had upgraded us to Main Cabin Extra, in the exit rows, so there was plenty of leg room. It was an easy flight and went quickly. In fact, we landed at MIA a little early. It took a little while for the bags to start coming out at the carousel, but ours were among the first so we grabbed them up and headed to the taxi line, which only had a couple of people in it. 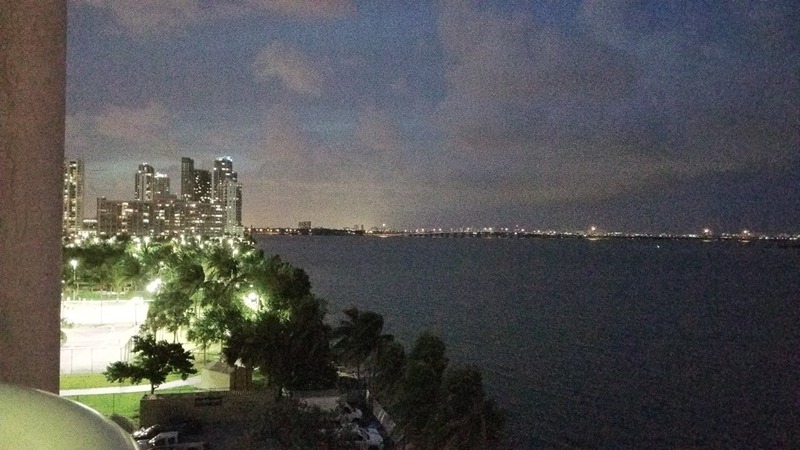 We were off to the Doubletree by Grand Hilton Hotel in Biscayne Bay. There were a few dark clouds in the distance but no rain, and it was breezy with a nice temperature. I had taken a leap of faith with this hotel, as I’d never stayed there before. 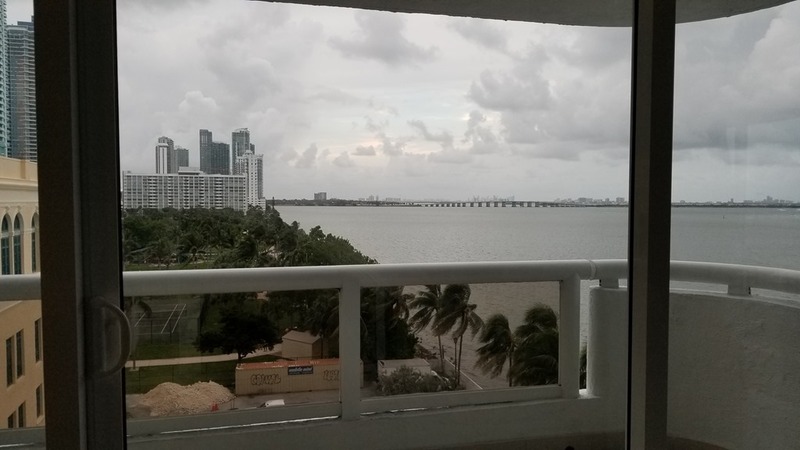 I usually like the Holiday Inn Port of Miami but it was full when I booked. I wanted something nice, and not too far from the cruise port. This one had good reviews on Hotels.com and was (relatively) reasonably priced (for Miami on the weekend). 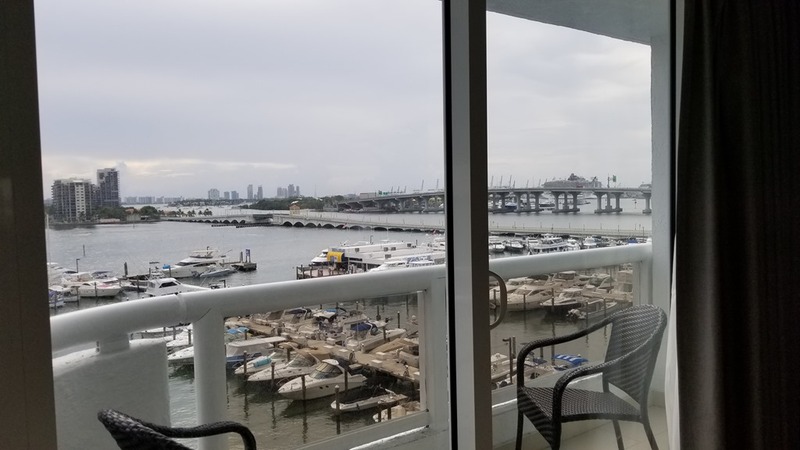 When we arrived at the hotel, we were happy to see that it was right on the bay, and I hoped we would get a room with some water view. I never expected what we did get. As we walked into the lobby, I got a very good immediate vibe. This was an upscale type hotel and there were quite a few people milling about – with dogs. I never did find out exactly why, but there were a lot of dogs at that hotel that weekend. Of course that made us feel right at home. I gave the lady at the front desk my name and she looks up my reservation. 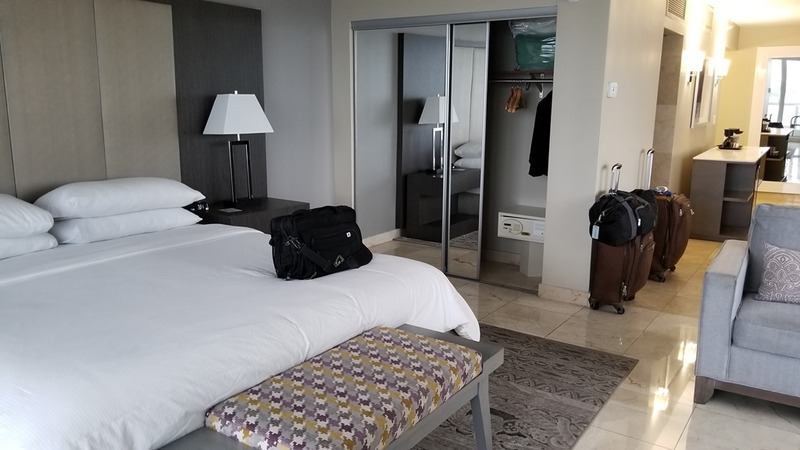 I really didn’t remember what I had booked since I’d done it half a year ago, but I thought I had gotten a regular “deluxe” room, which at most hotels meant a regular room. I had pre-paid, so if they wanted to give me a suite, that was fine with me. We got our key cards, navigated through the hallways to find an elevator, and made our way up to the 8th floor. Well, our room was way at the very end of the corridor. In its own little private corridor, in fact, where the floors turned into marble. That seemed like a good sign. And indeed it was. 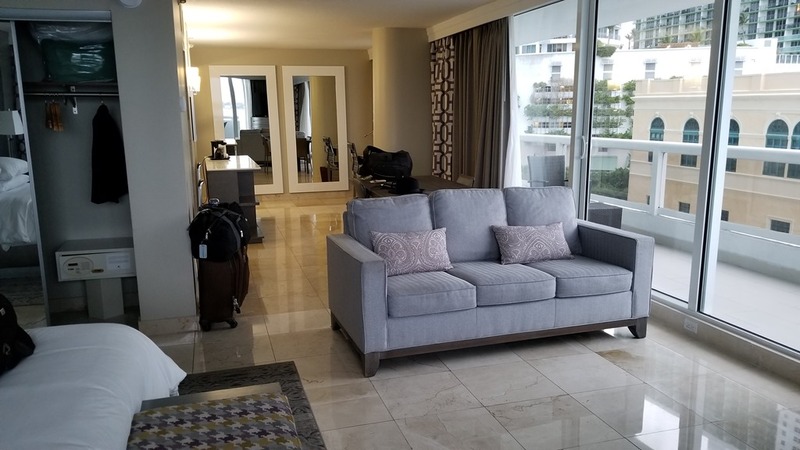 When we opened up the door and walked in, I couldn’t believe I’d gotten this room for about twenty bucks more than I paid for a decidedly not upscale La Quinta Inn near the MIA airport the last time Tom came to Miami with me a couple of years before. It wasn’t a true suite (by my definition) in that there wasn’t a separate bedroom with a door. But it was deluxe enough to make up for that. 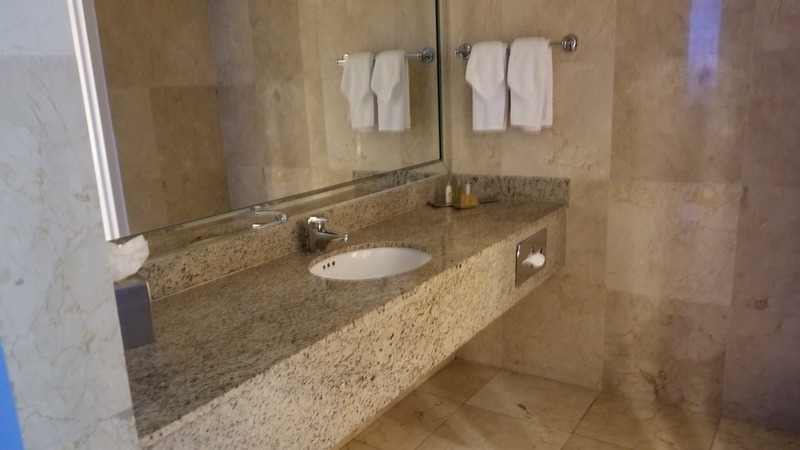 There was a big comfy bed, a full sized sofa and large TV viewable from both, a big dining table and a full sized desk, a credenza for the coffeemaker, a beautiful stone tiled bathroom with a great shower and even a bidet. But none of that was the best part. The view … oh, the view. 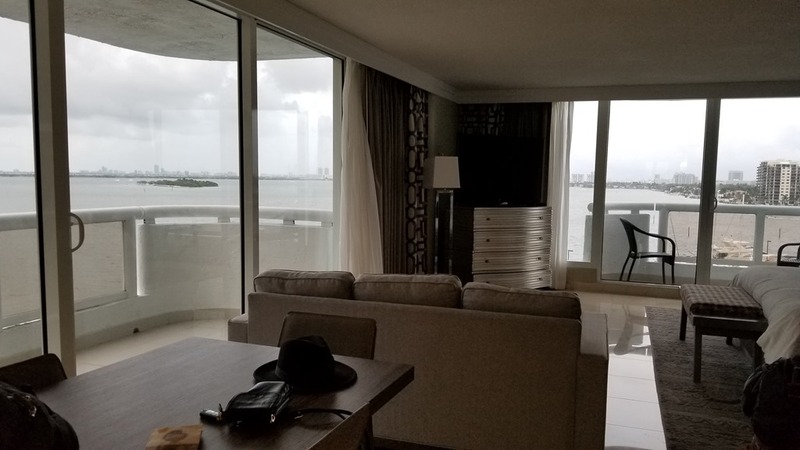 Floor to ceiling sliding doors and windows wrapped around two sides of the room, leading to two balconies that looked over the bay and marina, with the bridge off to the right and the cruise terminal right behind it. It doesn’t get much better than that. Since we’d gotten in late, we were both hungry. 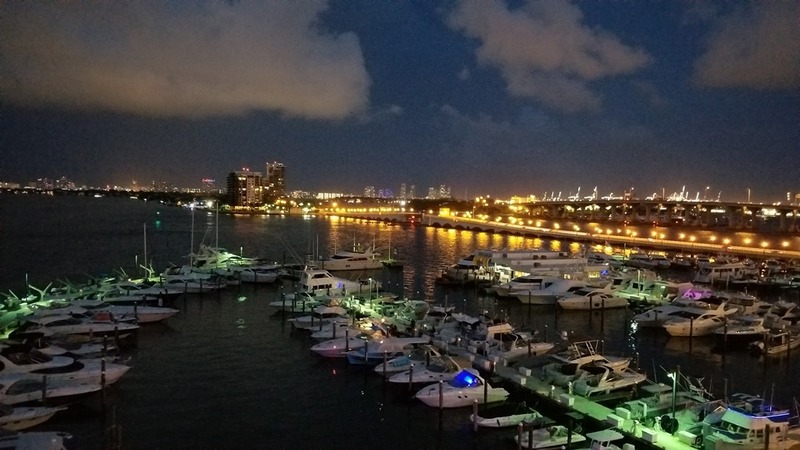 We debated whether to call for room service or venture out into the streets of Miami, and settled on a compromise: we’d eat at the restaurant that was there in the hotel. 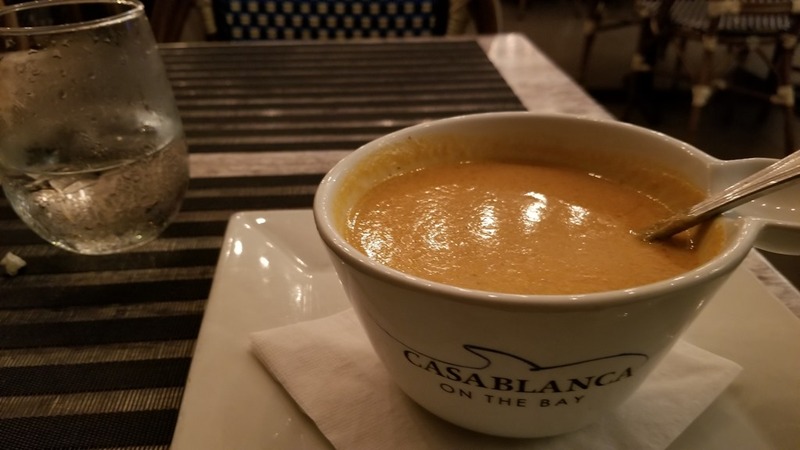 It was called Casablanca on the Bay, a name that implied more nice views, and there was no false advertising there. It took a little while to find it as we wound our way through the business and conference part of the hotel, but eventually we got there (without having to go outside). For a Friday evening, it was almost deserted (maybe everyone else got lost in the bowels of the business center trying to find it, or maybe we were just a little early). 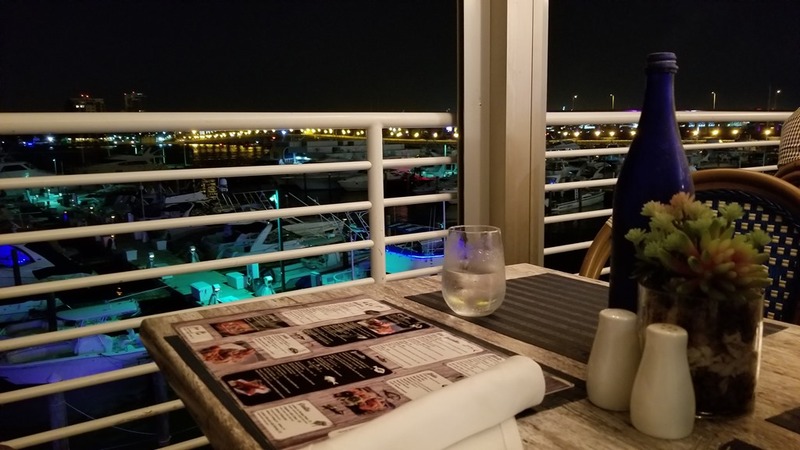 We chose to be seated out on the patio overlooking the marina. By that time it was starting to get dark and the lights across the water were spectacular. There was a nice breeze that made the outdoor seating comfortable. The waiter was friendly and prompt to take our drink orders. 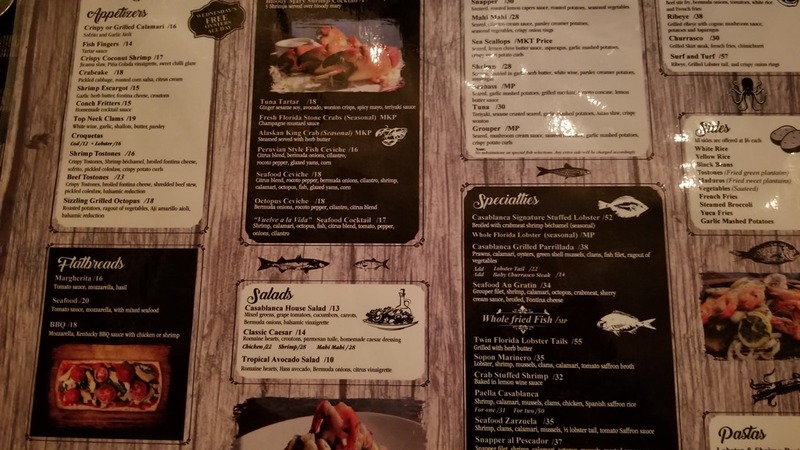 The menu was seafood-centric, which I like. To start, I ordered conch fritters and my husband ordered a crab cake. 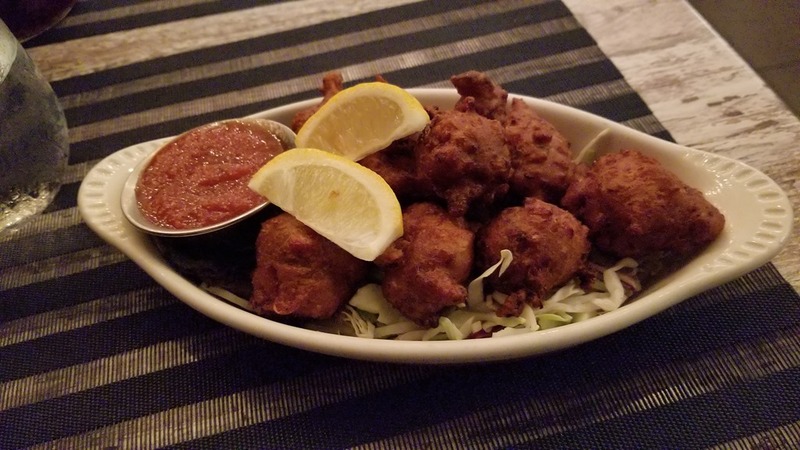 The fritters were very good, not rubbery but tender inside and crispy outside. The crab cake was presented beautifully and apparently it was good judging by how quickly my husband devoured it. As our entrees, I had the lobster bisque and my husband had a crab stuffed shrimp dish with garlic mashed potatoes. The bisque was very good and he thoroughly enjoyed his. 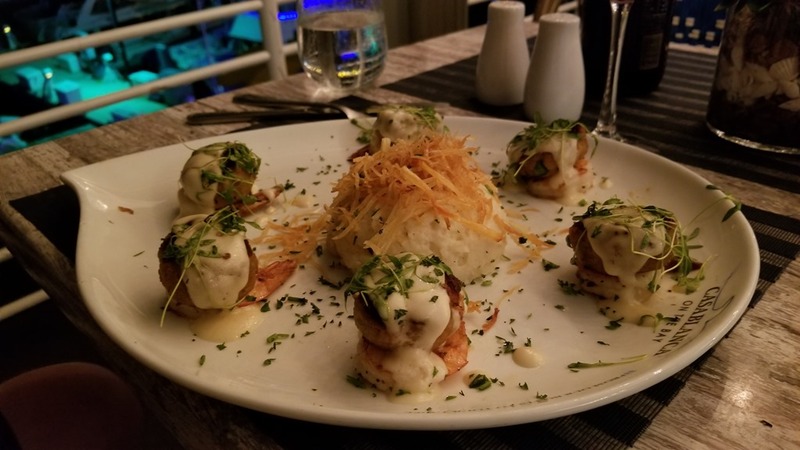 My only complaint, if I had to come up with one, would be that the portions were just a tad skimpy for the price — but that’s not unusual in Miami, I’ve found. 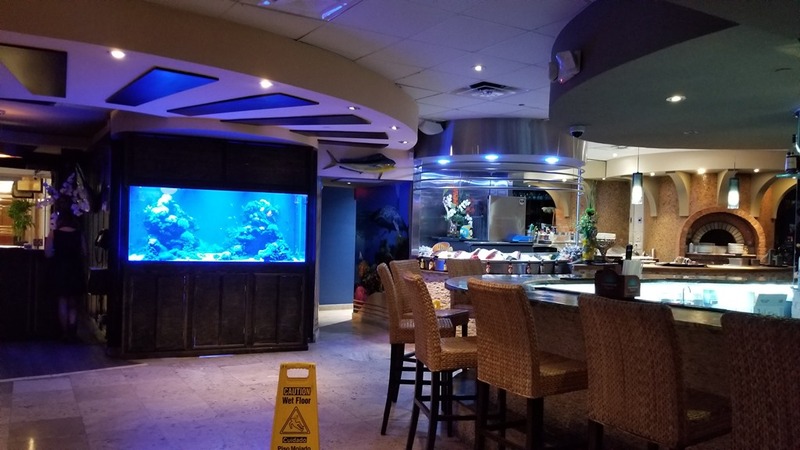 The food was excellent, service was fine, and the restaurant decor was lovely, including a big aquarium in the front and a fish-on-ice bar. We were both too full for dessert, so we made our way back through the maze to our room, sat and enjoyed the night lights for a while, and went to bed early since it had been a long day. The next morning, we slept until almost 8:00 a.m. and took our time getting ready to check out and embark on our embarkation adventure. Throwing open those drapes was an experience – the first thing I saw was our ship, the lovely Seaside, just across the bridge, waiting for us. Check-out time was 11:00 a.m., and we left a few minutes before. Had another pleasant encounter with the front desk personnel, saw more dogs running around the lobby, grabbed a taxi and we were on our way to the port. 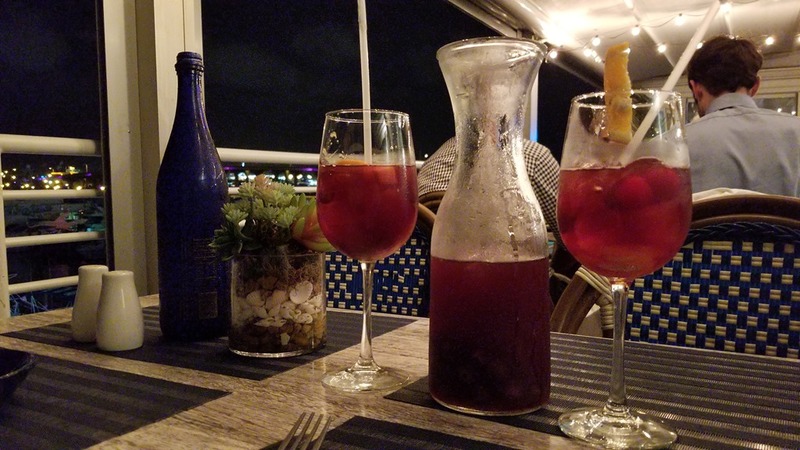 The cruise would begin with two sea days, with another tucked between SJ and Nassau, which is perfect because it gives you time to explore the ship and get to know others on board before you start getting off for ports. After the unexpected upgrades and excellent experiences on the flight and at the hotel, I had high hopes for this trip as the cab pulled up to now-familiar Terminal F at the port of Miami. In Part 2, we’ll see how that works out.